This was one of those things that I HAD to have...but had no clue why. But I knew I couldn't justify spending a lot of money on it. I got the box for $11 at JoAnn Fabrics, bought a few bottles of acrylic paint, and had some more paint and brushes at home. It took me a good long, rainy weekend but it was a fun project. I was inspired by an Etsy seller, but she doesn't appear to be on Etsy anymore. Step 1: I drew the rectangle for the card hole then drew the design on with pencil. Step 2: My husband is much more trusty with sharp objects, so I asked him to cut the hole using an Exacto knife. Step 3: I painted the box a solid color, then waited. Then I did another coat, and waited. Then a third coat. Step 4: I did the same as step 3 for the design and then did some touching up. Step 5: I sprayed the entire box with a clear protectant and left it outside to dry. Later I did a second coat. My sister was the inspiration for this project. She lives in Florida and was very worried about what the weather would be on the big day. And rightfully so, since we have anything from sunshine to snow on any given day of the year. It ended up being 78 degrees & gorgeous, but it did cool down after sunset. These were knit using a "fan and feather" pattern. I don't remember who publishes the pattern but I will try to add later. They were knit with Baby Bunny yarn in the color celery and they are SO soft! Originally, I wanted to make each of the 4 shawls in a different pattern, but my husband and daughter loved this pattern and voted that all 4 should be done this way. I pretty much followed the directions on her site. I threw away 20 or 30 roses before I got it right, but once I did, I got a lot faster. It's definitely a movie-watching project. I added a dot of glue pretty often (more often than the tutorial says). I takes about 50 roses to fill a pomander. I made 8 of them. I got the party streamers from the dollar store, total cost was maybe $25 to make 8 pomanders. We wanted to honor our families and also show off some of our engagement pictures we took ourselves. I bought wood frames for $1 each from a thrift store, painted some of them with a few coats of the acrylic paint I had left over from the card box, and sprayed them with the same protectant as the wood box. I've always loved succulents - and they love our greenhouse window. So, I grew some of these and then supplemented with nursery-bought ones. I found the containers at a local consignment furniture store. 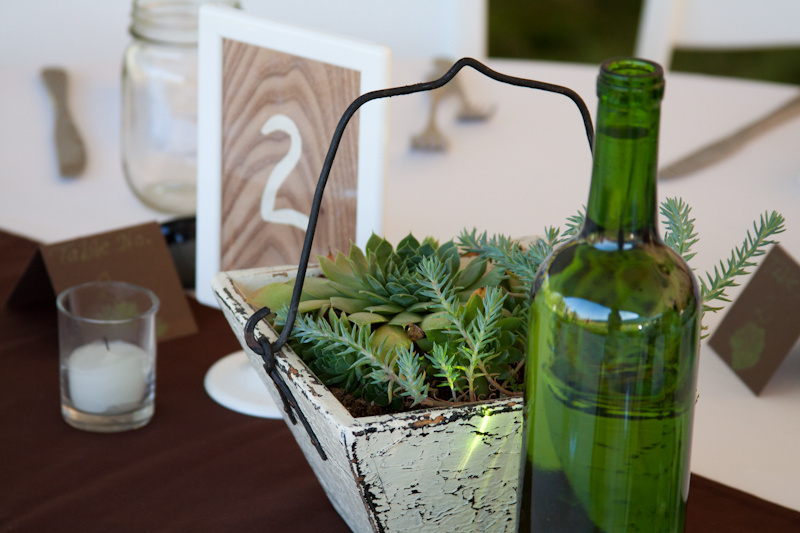 The table number frames were $1 at IKEA. My brother had the scraps of wood paneling at his sign shop (free! 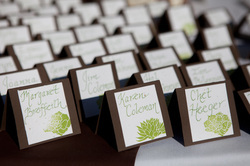 ), and I hand painted the table numbers with acrylic paint. I then stamped a succulent on each. Stamp is from Etsy seller DrumChickDesigns. 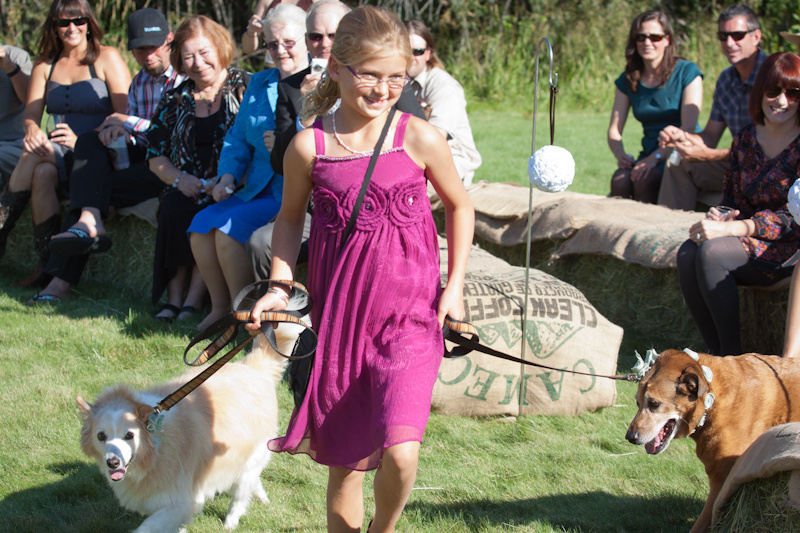 Our girls walked down the aisle with our neighbor. My mother-in-law made the felt roses (LOVE them!!) and I sewed them onto the collars. 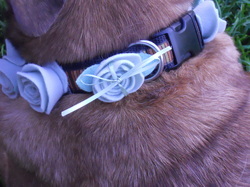 I sewed ribbon onto one rose on each collar so each dog could carry a ring. I made 4 cake stands - total cost was around $2 per stand - 4 plates, 2 wine glasses and 1 candle holder from the thrift store, and a bottle of waterproof epoxy from the hardware store. It was easy and they're so cute, that I recently bought more to make some as gifts. My baker didn't think they were sturdy enough for the cake, but she liked them so much that she made cookies for them so they could still be used. 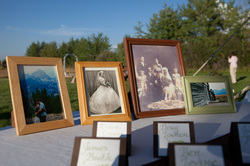 I can't take credit for the beautiful sewing-my mother-in-law made these great runners since we couldn't find any we liked that also fit in the budget. She also mailed me the stencil. I used a foam brush and acrylic paint to stencil the succulent design on. I cut leftover card stock into strips using a paper cutter. The white paper has wildflower seeds in it. Some guests took theirs and the rest I saved to plant next summer. 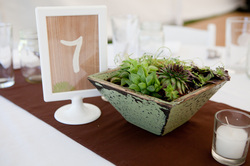 I did the calligraphy on them (the table number is written on the back) and stamped the succulent on them. The stamp is from Etsy seller DrumChickDesigns. Well, I guess we bolted down the aisle in a hurry (ready to get the party started?) so our guests didn't have time to bust out the bubbles until after we passed them. 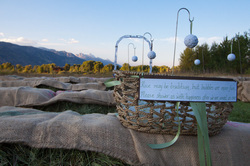 But, the kids still had a good time with them and I thought the basket turned out cute.